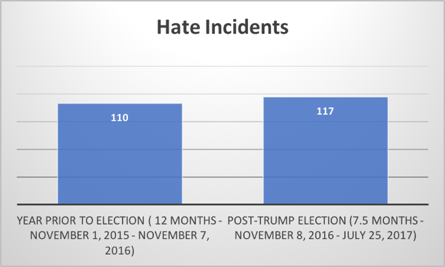 The election and presidency of Donald Trump has normalized the occurrence of hate incidents across communities. 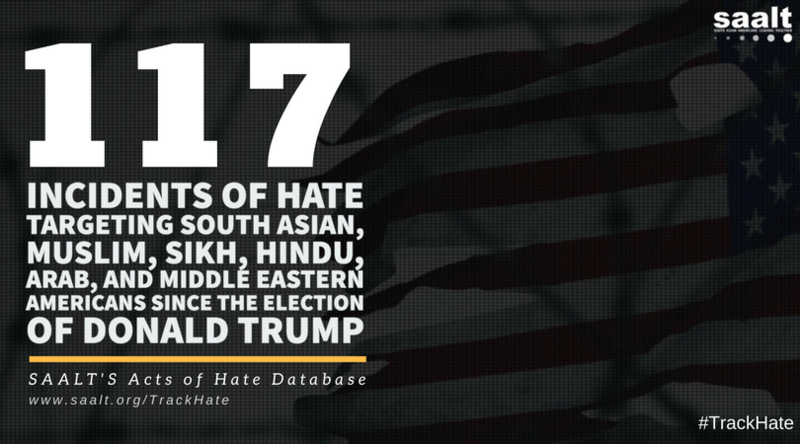 Since his election, SAALT has documented 117 incidents of hate violence targeting those who identify or are perceived as Muslim, South Asian, Arab, Middle Eastern, and Asian. The number of incidents has surpassed the total from the previous year and the average per week is about four incidents (not taking into account spikes in hate incidents post attacks that are labeled as “terrorist”). Undoubtedly, at this rate, the total number of incidents will double by the end of the year. Consistently, verbal and written hate speech and threats are the most common type of violence Muslims and those perceived to be Muslim face. 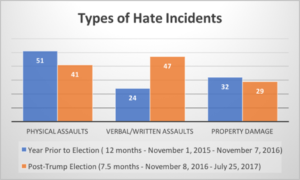 The total number of 47 verbal and written threats since the election is double that of the previous year. This is a concerning trend as it may be an indicator of the growing sanctioning of hate speech in the U.S. Just over the last month, an Augusta-area Mosque near Atlanta, GA received eight separate voice messages threatening “to shoot, bomb and otherwise attack mosques and attack Muslims in America.” The perpetrator has yet to be identified. Atlanta Council for American-Islamic Relations (CAIR) in response has sent out warnings to mosques and CAIR offices across the U.S. to be on alert. 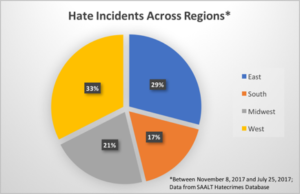 The pie-chart on the right demonstrates that the rise in the number of hate incidents are regionally relevant regarding occurrence and reporting. More than two-thirds of documented hate violence occurred in the Eastern and Western regions of the U.S. where many immigrant, Muslim, and South Asian communities are concentrated. The higher proportion of documented hate crimes in these regions is due to a variety of issues related to ease of reporting, visibility of the crime, and visibility of the victim. As a result, the spotlight on these regions should be viewed critically. The normalization of hate incidents is a critical issue facing marginalized communities. A few noted signs of normalization in the media are: 1. the slow pick up of hate violence reports by news media, 2. the infrequent reporting of hate incidents by major news outlets, and 3. the reduced overall air time on hate incidents targeting communities of color. Local news media are more likely than major national news media to report hate incidents. Further, there is a three to four-week lag between the occurrence of an incident and the reporting by local news. This lag may be intentional on the part of targeted communities to protect victims and report incidents to the news once all the details are discerned. Yet, the lag of almost a month in combination with overall reduced air time on hate violence, particularly against communities of color, may also be indications of the normalization of this type of violence and thus supposedly not as newsworthy.